(Dan Trimmer, 1999). Tet (Tetra Delightsome x One Step Beyond) Dormant 6” M Re 28” This large deep ruffled pink represents somewhat different genetics than most of the current tetraploids on the market. 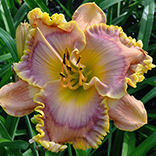 DELIGHTSOME, Sara Sikes sibling to NEAL BERREY proved to be a wonderful parent when crossed to John Benz’s lavender pink ONE STEP BEYOND. 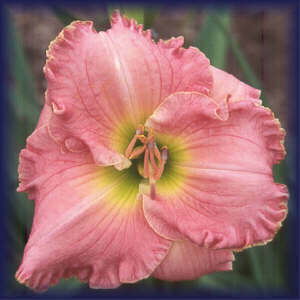 I got large size from ONE STEP BEYOND, and the wonderful pink color and ruffling from a line (Sara Sikes pink diploids) not seen before on the tetraploid level. Very dormant, ROSEHAMPTON took the year off when we moved from NY to Florida, but this year surprised me and performed like a Florida native. Pod fertile, but not easy, I’m excited about the seed I made this year in my expanding large flowered pink program. Budcount was 18 this year but was higher in the north.